It’s nearly spring in New Zealand. That means that around the country the temperatures will rise and the country begins to burst with new life. Colourful flowers, baby wildlife and ‘waterfall season’ makes this an inspiring time of year to visit. New Zealand families love to welcome new cultures into their homes and share their own, teaching their au pairs Kiwi slang and helping them to discover the beauty of Aoterora, the Land of the Long White Cloud. I have been to New Zealand on numerous occasions and it is truly one of earth’s purest places, with untouched beauty, fresh unpolluted air and lots to learn and explore from. 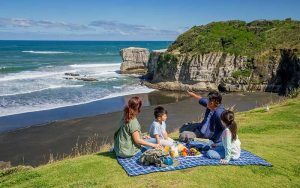 New Zealand families are very outgoing, you will rarely find their children stuck to their phones and ipads, they like to explore and do fun activities over the weekend and are into watersports and other outdoor activities. Why not be an au pair in New Zealand, and whilst living with a lovely family, have an experience of a lifetime. Escape the harsh winter of the Northern Hemisphere, enjoy the great weather and create memories you will never forget. To register please click on to this site and let the rest be history….